My seven year old daughter, Hannah is very creative. She loves to write and asked me recently for her own journal. She just finished her school year with excellent grades and as a reward I thought that even better than a journal is the Imagine I CAN® Notes ‘N Stuff stationery set by The Manhattan Toy Company. The Notes N’ Stuff kit is one of the latest new releases in the I CAN® play kits series which features games and kits which are perfect for summer break. There are so many different ideas to choose from so that you are sure to find the perfect products to promote your child’s creative expressive and interests. 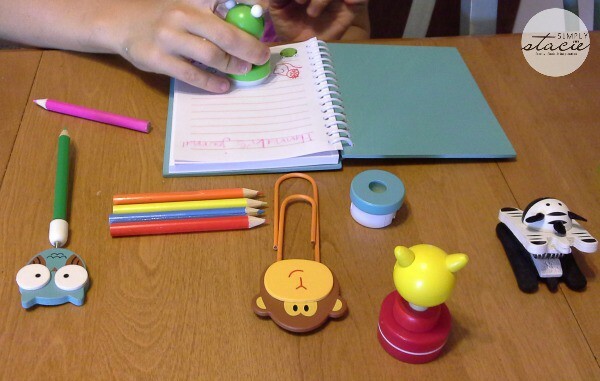 Hannah was thrilled when presented her with the stationery kit, the Imagine I CAN® NOTES ‘N STUFF (SRP $20). I love that this kit comes in a fun, handy tin storage case so it is easy to keep all the contents stored inside neatly between uses. It includes lots of fun writing accessories inside that is sure to stir the imagination of the next great writer, poet or artist. 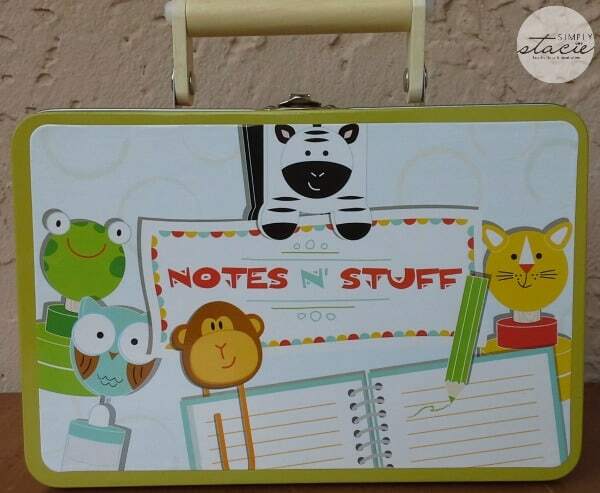 It features one spiral notebook that is perfect for journaling or doodling, six colored pencils, one pencil sharpener, one pencil topper, one magnetic clip and two self-ink stamps. 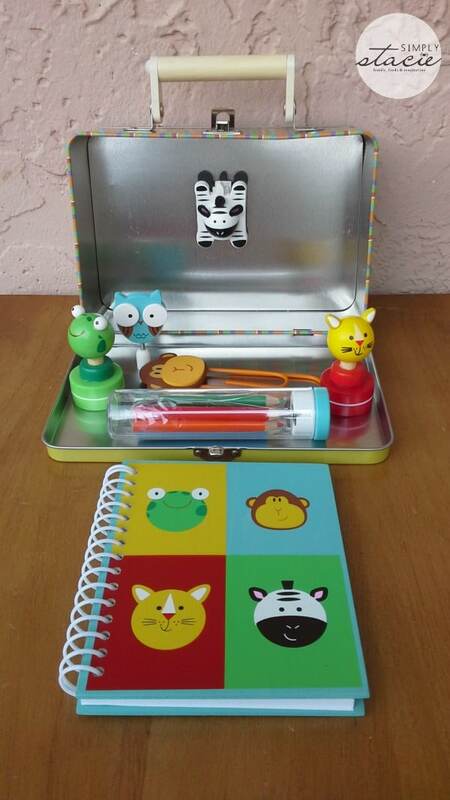 She really likes the fun animal characters and vibrant colors that makes this stationery kit especially appealing. This set will be perfect for vacation so she can write and draw her favorite memories, journaling her experiences. My three children ages 6, 7 and 9 have enjoyed many of the creative play kits, activities and games in the Imagine I CAN series. There are so many fun options which are available at budget friendly prices. I love that these are great hands on projects for summer that children are able to do themselves. Check out the fun magnetic games such as Character Mix-Up, Fashion Friends and Travel time which would be great for summer road trips. A few of our personal favorites that my kids have enjoyed in the past are the Pet Rock Pals, Create-a-Puppet Giraffe and Character Mix-Up. You are invited to visit The Manhattan Toy Company to purchase your favorite Imagine I CAN kits to keep your kids engaged this summer. Which one do you think would be a favorite in your home? Maureen is a SAHM who left the Corporate healthcare field to home educate her 6, 7 and 8 year old children. She is a voracious reader for both herself & her kids and also enjoys a natural and organic lifestyle. She lives in Orlando, Fl with her husband Mark, three children and 5 year old boxer, Jack. I also like the imagine i can travel set! Groovy Girls Bellissima Ballerina these dolls are all so cute love the mermaid gave 2 as gifts so sweet. I like Groovy Girls Doll Seraphina. My daughter would love any of the groovy girls! I like the Motorworks TR Convertible 3.0. I also like the Imagine I Can Fairy Enchanted. I like the Baby Stella. My daughter would love the groovy dolls! I think groovy Girls Princess Seraphina. i like the Dr. Seuss HORTON Large. The Motorworks wooden vehicles looks really cool. Thanks so much for the chance to win. we would really enjoy playing with the imagine i can finger paint fun! i LIKE THE STELLA BABY FOR MY LITTLE GIRL! I like the Imagine I Can Fairy Enchanted play set. my daughter would love the baby stella blonde! I like the I Can Fairy Outfit. Definitely Fraggle Rock Gobo. I loved that show!